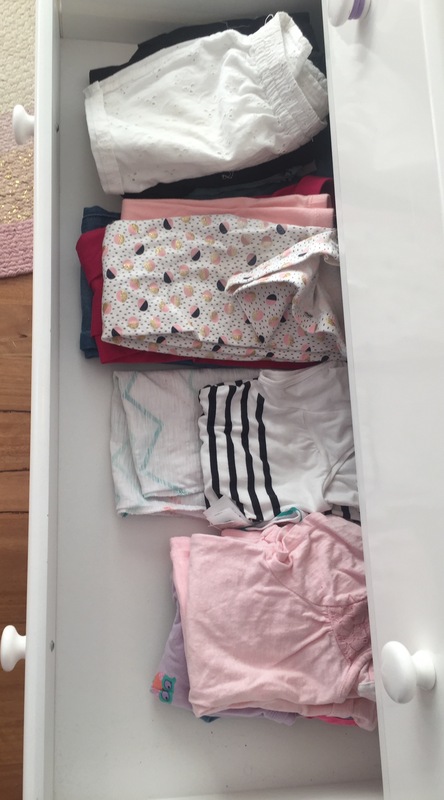 KonMari – Simply Organised. Simply Beautiful. Well as I am sure you’ll guess, my tidy/organised/decluttered heart of mine nearly exploded. This was my first “client” to practice patience and understanding on! This was my moment to shine – okay – getting carried away lol! 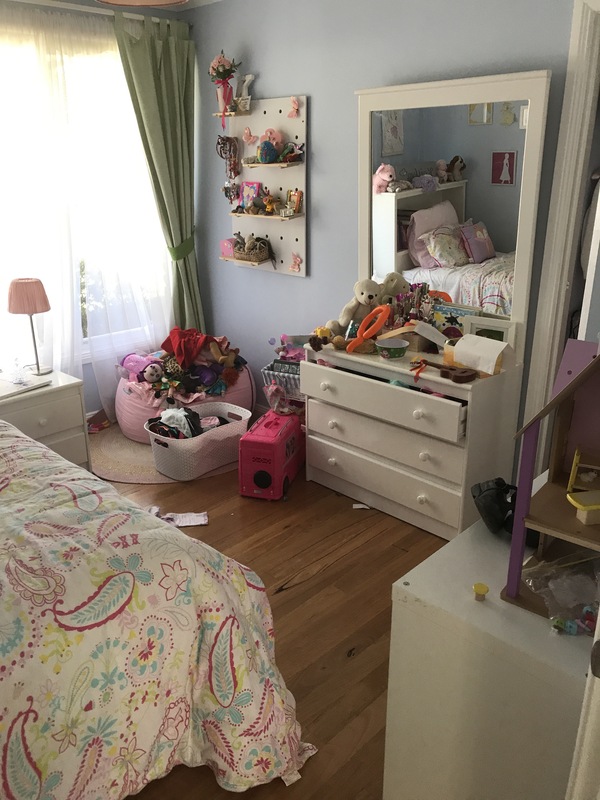 Growing up, I was pretty much allowed to have my room as I wanted it, but I wasn’t allowed to just throw things away if I didn’t like them, especially if one of the people mentioned above had bought it for me. Mum kept so much of my stuff from my childhood and handed it all over when I moved out of home. Most of it has been discarded. Some of it is sitting in my roof waiting to be dealt with. I don’t want this for my children. I wanted Miss 6 to know that she doesn’t need to feel guilty about discarding items. If they don’t bring her joy, then it’s time for them to go. The biggest lesson I’ve learned from reading Marie Kondo’s books. So, we started. We gathered all her soft toys. She wanted to move most of these to the playroom. 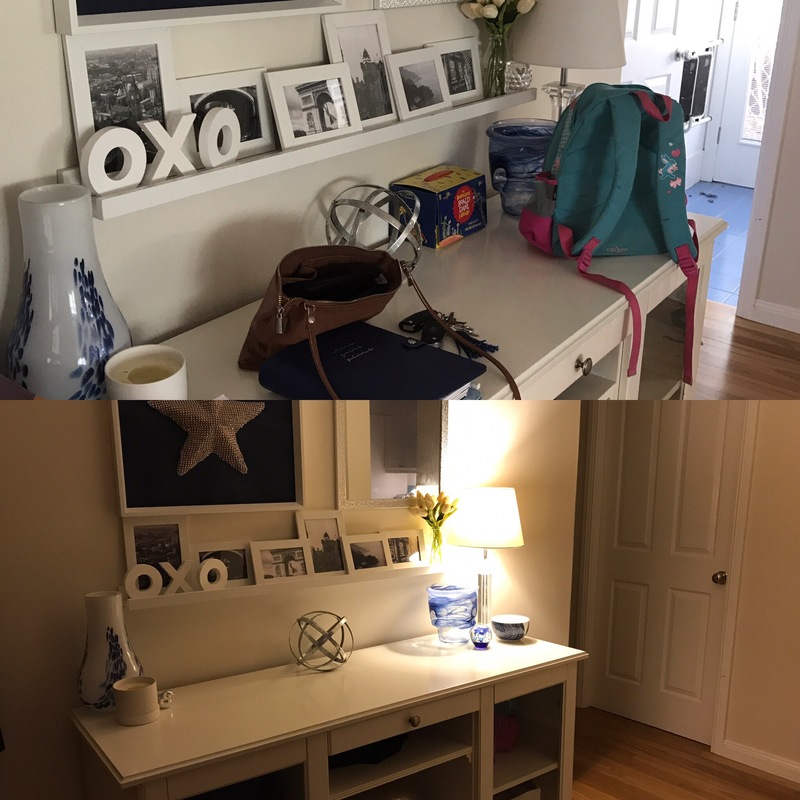 We pulled everything off her dressing table and wall shelves. I grouped like with like and she chose which rocks/sea shells/necklaces/bracelets/craft items etc etc that she wanted to keep. We then gave everything a wipe over and started placing everything back. I also let her decide where things were to go, only making suggestions if it was an item her brother may try to break and suggesting it go up high. 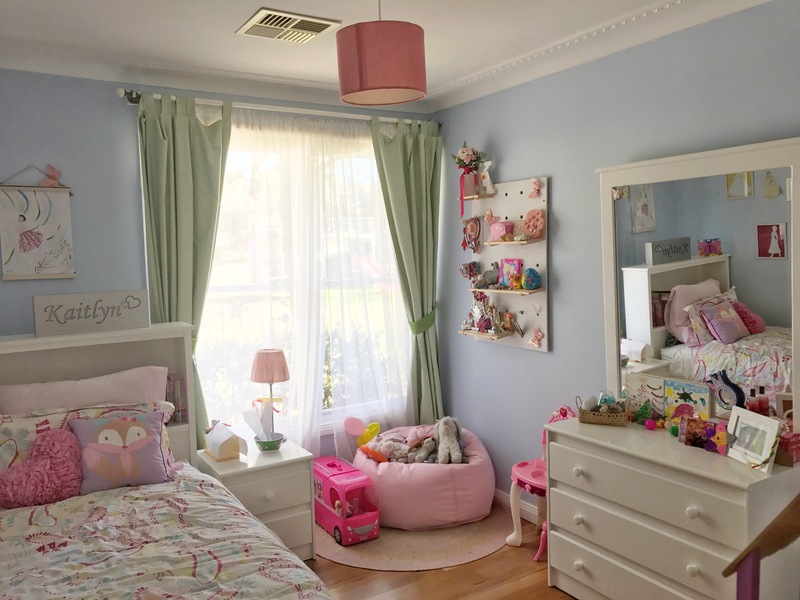 She is now very proud of her room and gave her brother a tour when he woke from his nap. Do you take this approach with your kids? Had success? Do you think this may be an approach you’ll try? 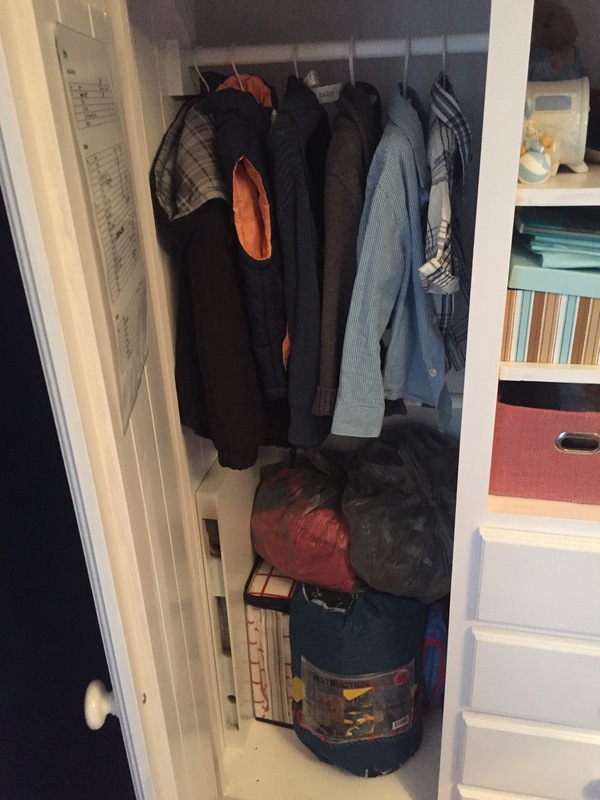 With the warmer weather on its way, I thought I would take the opportunity to go through the kids wardrobes and clean out the old, organise what currently fits and make a note of what we need going forward. So many clothes! Her winter drawer became too cluttered, I couldn’t close the drawer properly! 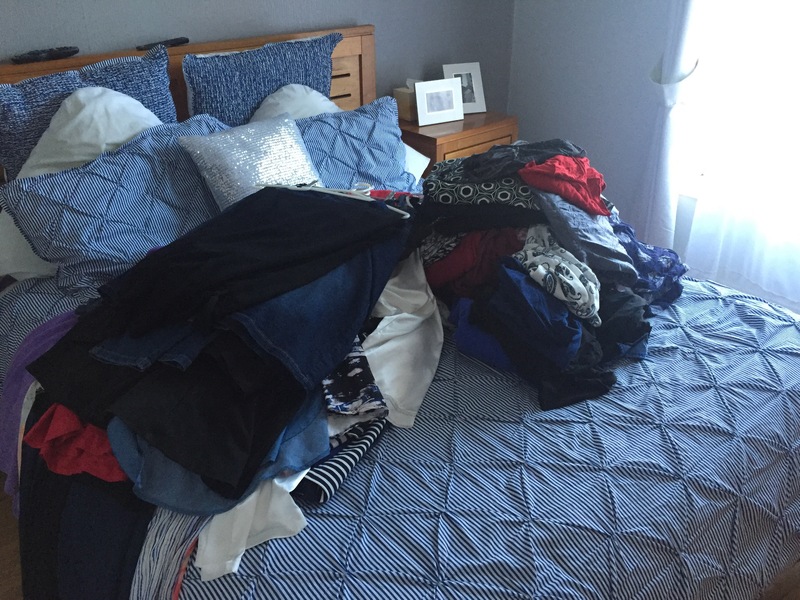 As with the KonMari Method, I pulled all the clothes out and laid them on her bed. 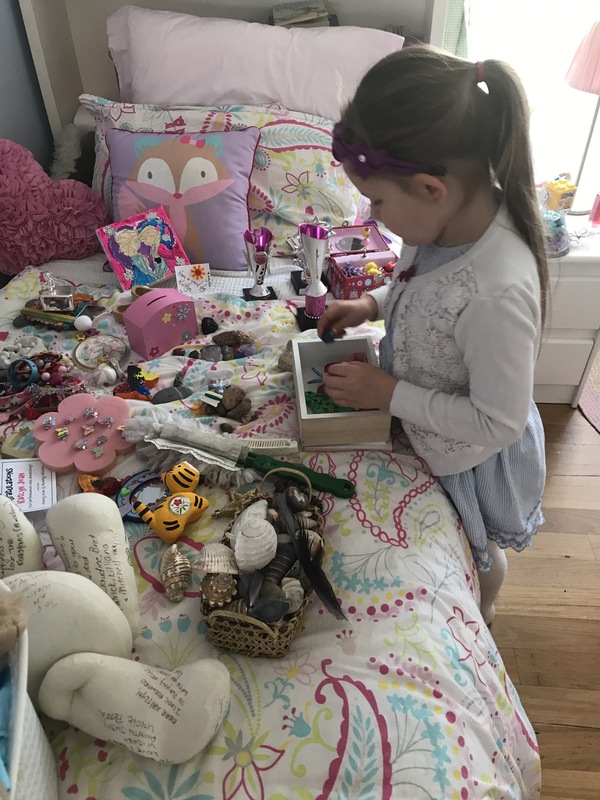 I got Miss 5 into her room to try on anything I wasn’t sure would fit her, discarded anything not fit for passing down to my niece, bagged up items for my niece and returned current items that fit to the drawers/wardrobe. I followed the same system for Master 3 of pulling everything out. A number of items needed to go as they were a size 2 and far too short on him now. 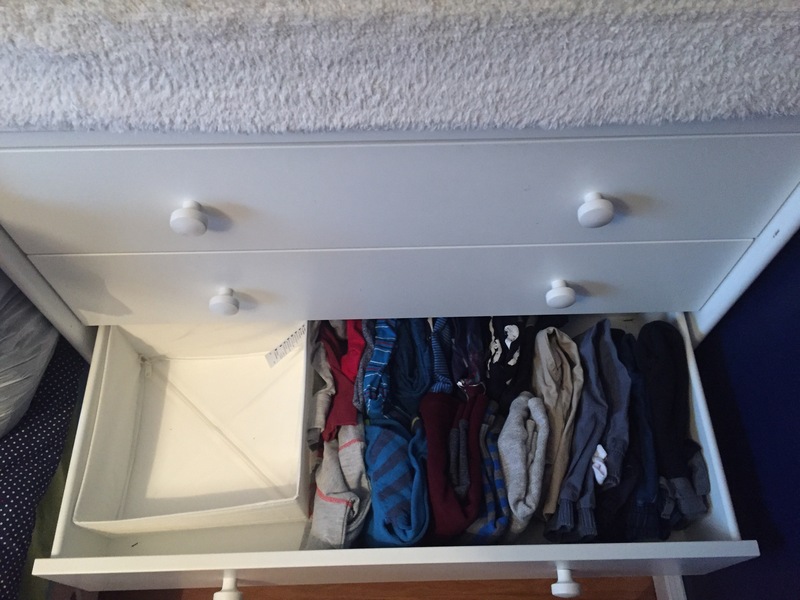 I use the Scubb boxes from IKEA to sort like items together in his drawers. This works especially for my husband as the clothes for daycare go in the larger boxes. Out of their rooms came a bag of clothes each, a bag of shoes from Miss 5, a small bag for a friend from Master 3 and a bag of linen for donation. 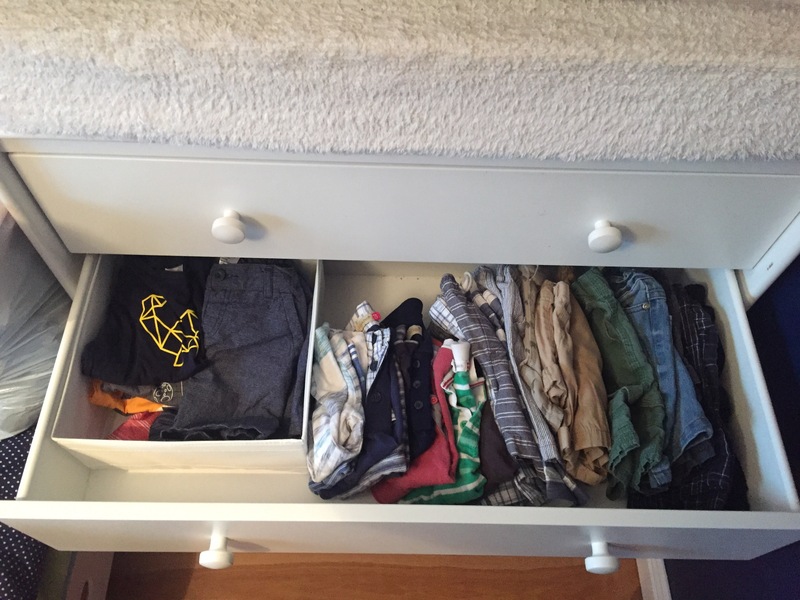 How often do you clean out your kids clothes? I aim to do it seasonally. I first did my wardrobe on 25 June 2015. Marie asks you to gather all your clothing from around the house. 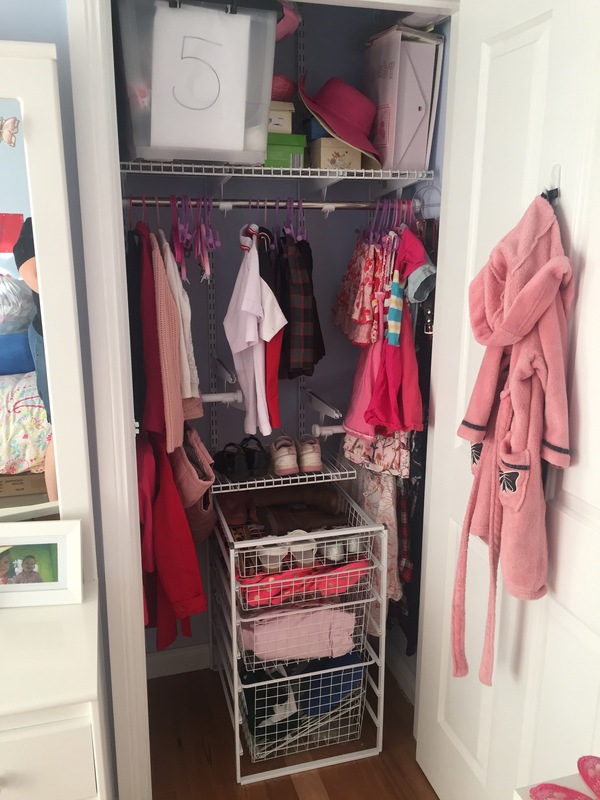 Some homes have coat closets so you would need to empty them out as well. This was what was amassed on my bed when I emptied out my wardrobe and all my drawers. Some of it was very easy. I don’t generally spend a lot on my clothes. My weight has fluctuated greatly over the last 5 years, so I don’t like to spend too much on each item. Some of it was hard. There was a leather jacket I bought in Melbourne. A mistake really, at the time of purchase and only worn once, but the cost of it was ringing in my ears. So many left over coat hangers. I donated a bulk of these to Lifeline with my clothes. 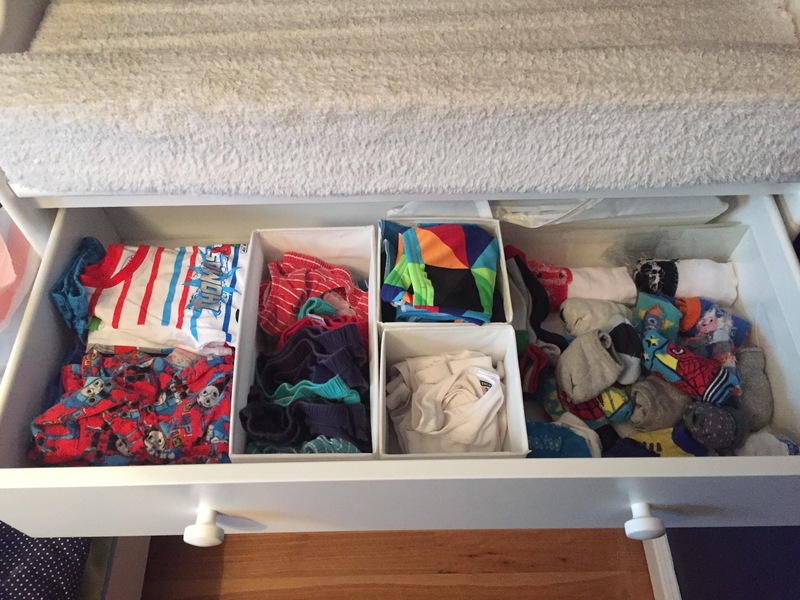 As I said on Saturday, with the recent release of the KonMari App, I thought I would go over each area again and see if I could improve some more. Step 1: Make your bed. It will make it so much easier to begin with a flat, tidy surface. Step 2: Get EVERYTHING out. All tops, bottoms, dresses, outerwear, socks/stockings, underwear, seasonal wear, bags, hats and belts, shoes and jewellery. Step 3: Commence looking at, feeling and assessing each item of clothing. As I had already done the clothing category last year, and I have honed my skill in assessing weather something brings me joy or provides a purpose or not, I completed the entire category in 1.5 hours. I didn’t get rid of any handbags. 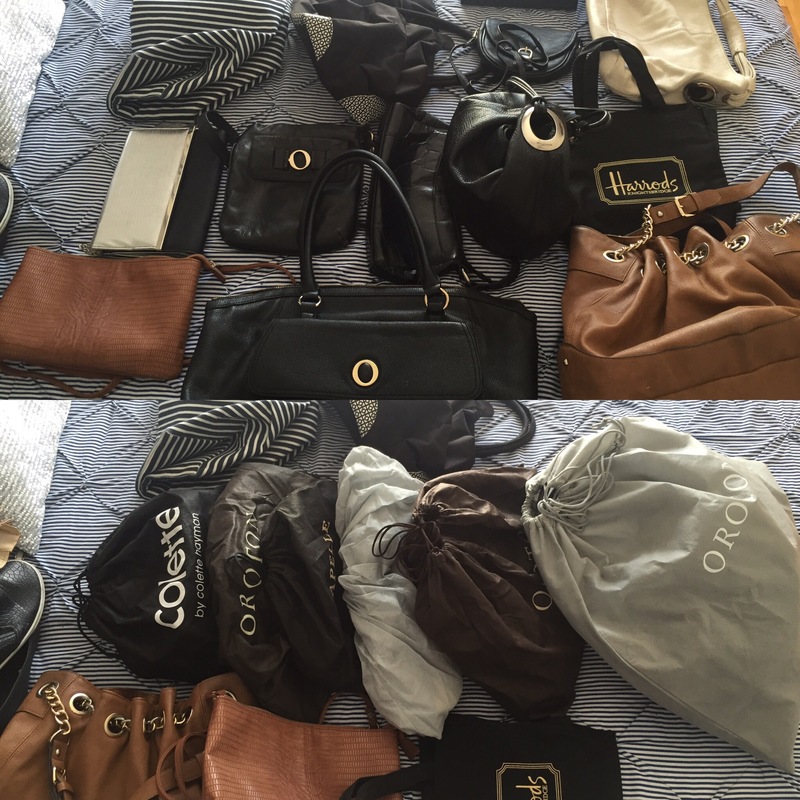 I like to change my handbag depending on the outfit that I’m wearing. I have used all these bags in the last 12 months. I gave them all a wipe over and returned them to their dust bags. I have plantar fasciitis and I’m in the process of moving over from the Kmart/Target cheap flats to shoes with better support in them. I have discarded shoes that no longer bring me joy aesthetically and as I replace current shoes with shoes that have orthotic support I will discard my current ones. 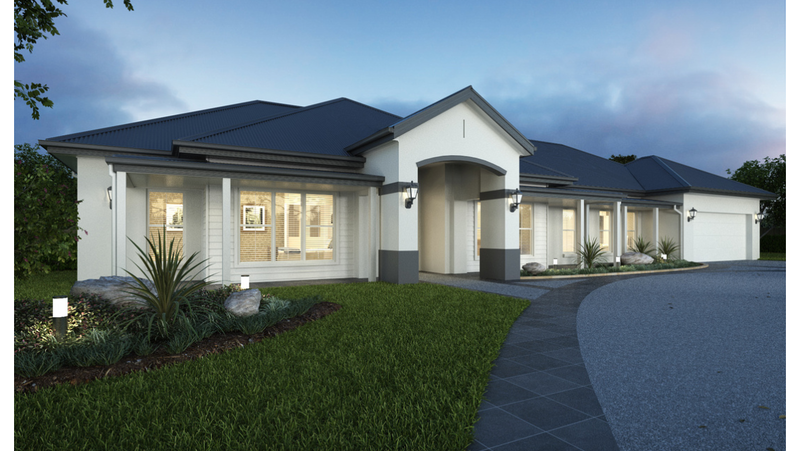 This will need to be a gradual process due to finance. I can now say that everything in my wardrobe brings me joy. There are clothes that are too small for me at the moment. I am hopeful that by the summer time they will be fitting me again. If not, I will reassess those clothes in the summer. 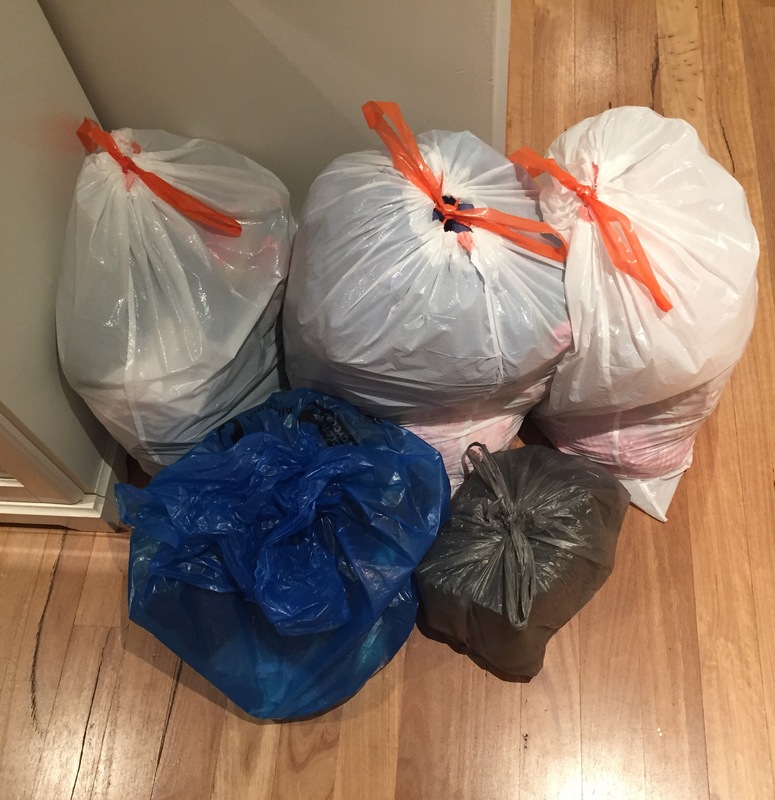 So, one bag of clothing and one bag of shoes have been discarded. There is a small shopping bag of clothes for the rubbish. You might think that I have too many clothes. You might think I have enough. I am content with the quantity. Certainly, before I commenced this journey I would have to swap my wardrobe around seasonally. I used to have a large storage container where I would put my off-season clothing and place up in the roof cavity. So pleased I don’t need to do that anymore! If you have gone through your wardrobe and don’t have anything left, consider reading Unlock Your Style by Nikki Parkinson. Her book is fantastic for teaching you how to build your wardrobe. 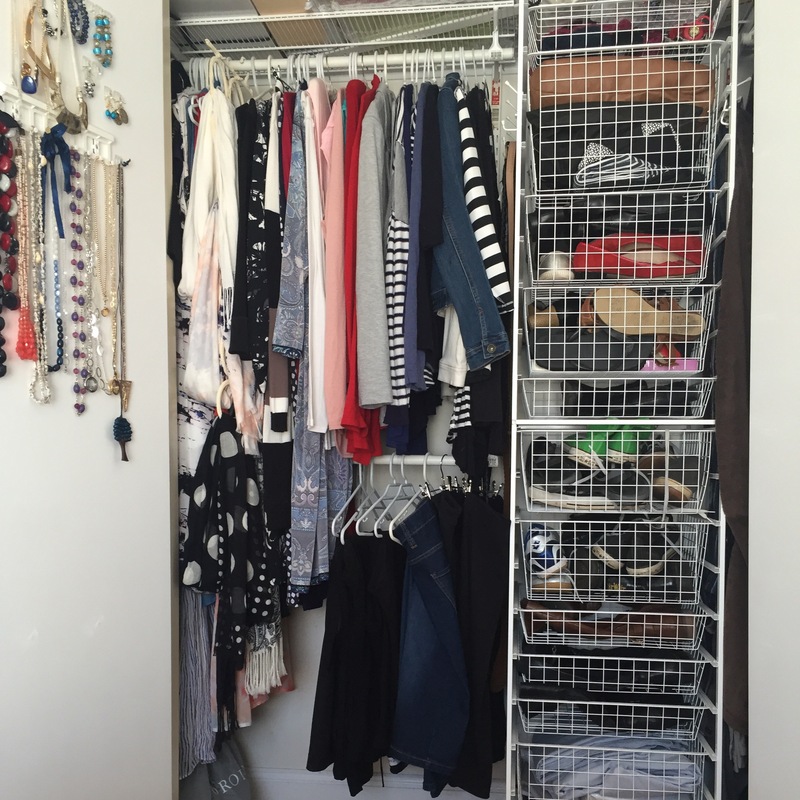 Are you embarking on your own KonMari journey? Are you pleased with your progress? I’d love to see your pics too! Tag #simplyorganisedsimplybeautiful on Instagram, post in the comments on Facebook or message me! I’m a Konvert! 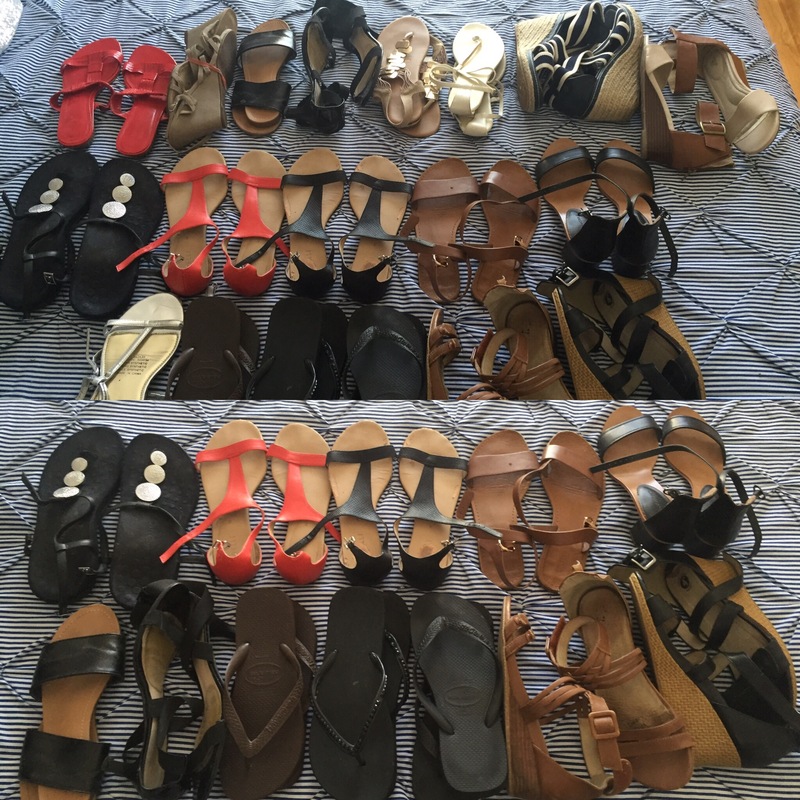 I’m following the Kon Mari method by Marie Kondo. You can find out all about Marie and her method here. Why did I choose to do this method? I felt like the house was closing in from all the stuff. I think we go through different stages in our lives of collecting and shedding. My husband and I moved out of our respective family homes when I turned 21, into the home we are living in today. We only had the stuff from our bedrooms so we needed to build the supplies you need for a whole house. With my 21st came traditional 21st birthday gifts, all of which, very well received. Dinner sets, serving bowls and plates, sheets, vases and cutlery. Our mothers then started going through their cupboards and kindly passed on all manner of objects that they thought we needed. I thought so too seeing as they’d had them. We carried on accumulating things for probably seven years. 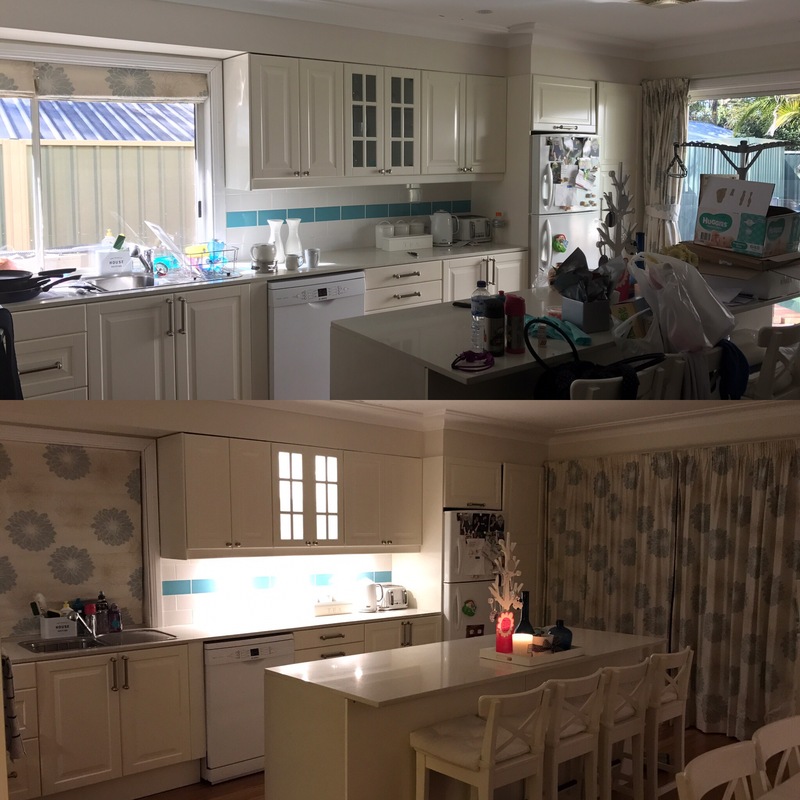 Our daughter was born in 2011 and we undertook a relatively large renovation. I’ll go into that renovation in another post. 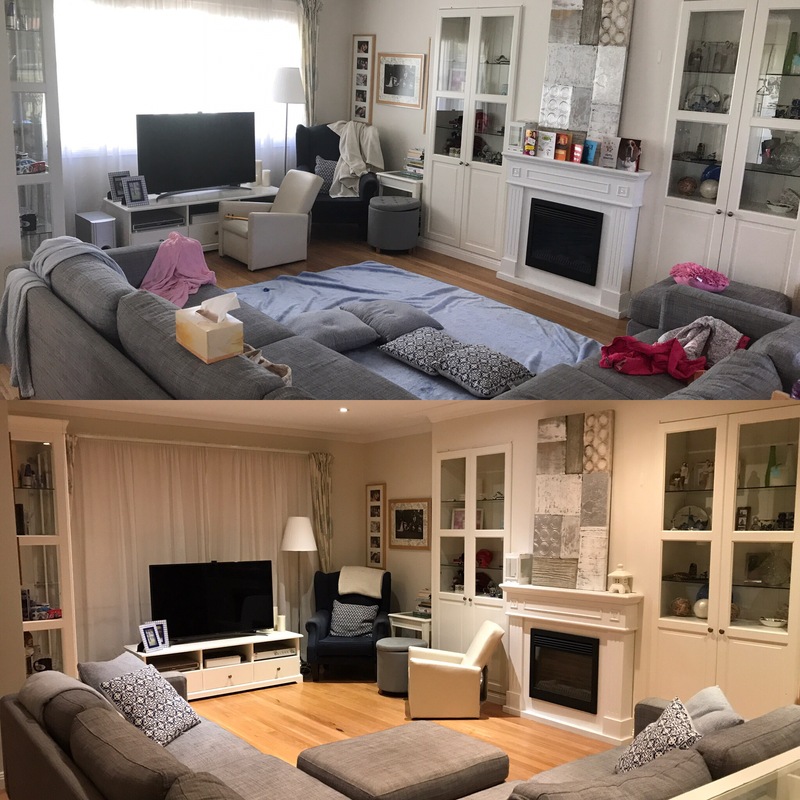 The renovation was such that we had to completely empty the house and store all our belongings in a storage pod and house-sit at my sister-in-law’s for three weeks. At this time my tastes started to change. I no longer wanted the beech coloured furniture. I was sick of the hand me down couches that didn’t match and having to constantly fix the blue covers we purchased from Spotlight. It was around this time that I started to get rid of little bits and pieces. In around August 2012 I came across a spring cleaning/organising group on Facebook which started in September. The checklists on offer for each area of the house were fantastic for going through each cupboard and advising the best way of cleaning the different appliances etc. I found it hard to keep up with the weekly challenge. Even though it was only one room week, I had upped my days at work from two days per week to four days per week and had recently fallen pregnant with our son. I persevered though, and as I had time, I started cleaning out cupboards with gusto. But some things kept me back from getting rid of as much as I wanted to. My mum bought that for me. My mother-in-law bought that for me. My husband bought that for me. Someone bought it for me. So whilst a lot of things did leave the home, with two young children the rate of accumulation exceeded the rate of what we were getting rid off. 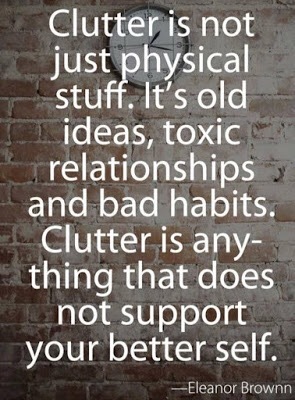 Now I don’t want you to think that we were hoarders. 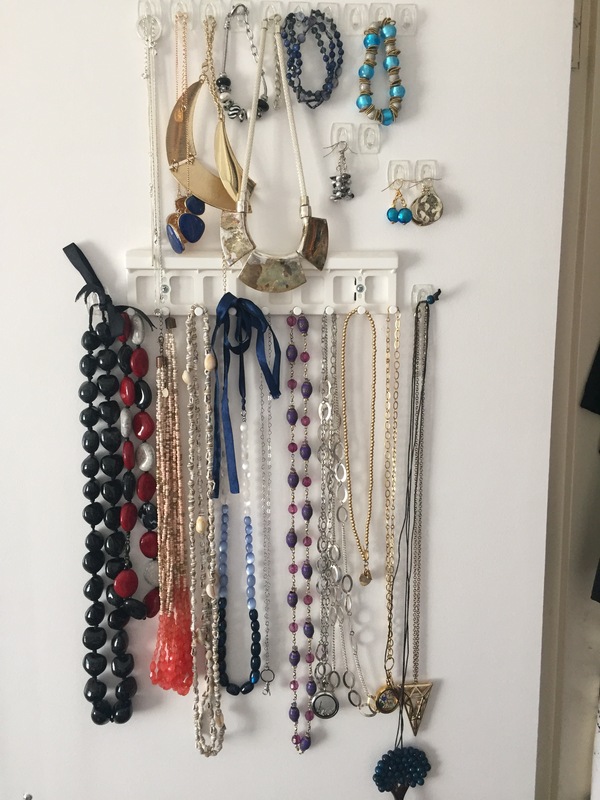 That is actually a very serious issue, usually needing some form of counselling and the assistance of a specially trained professional organiser to assist them with decluttering the stuff. There was just more stuff in this house than I could handle. Then followed the usual haze of night feeds, two children under 2 1/2 and everyday life and things stalled again. It’s probably about a year ago now that I purchased The Life-Changing Magic of Tidying by Marie Kondo. I bought the iBook version so that I could read it on my phone anywhere I went. Namely on the train on my commute each day. Little did I know, I was helping myself out by not purchasing another physical item that would clutter up my home. I devoured the book. Simply, it just made sense. 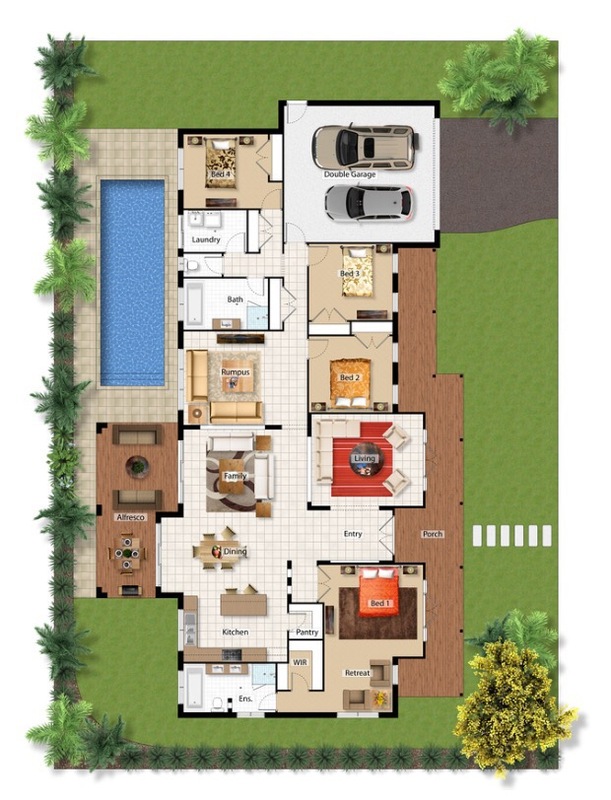 The very basic premise of the book is to consider whether the items in your home bring you joy. Now for those of you that have read it, I don’t empty my handbag out every day. I don’t talk to my clothes. But the act of really thinking about each item and whether or not it sparks joy, really helped in making decisions on whether an item should stay or go. Remember those excuses? It felt like the book gave me permission to let go of things that other people may have bought me or our family, that didn’t bring me/ my family joy. The other thing that I like about Marie Kondo’s method, is that you gather all like items from around the home before you commence culling and sorting. 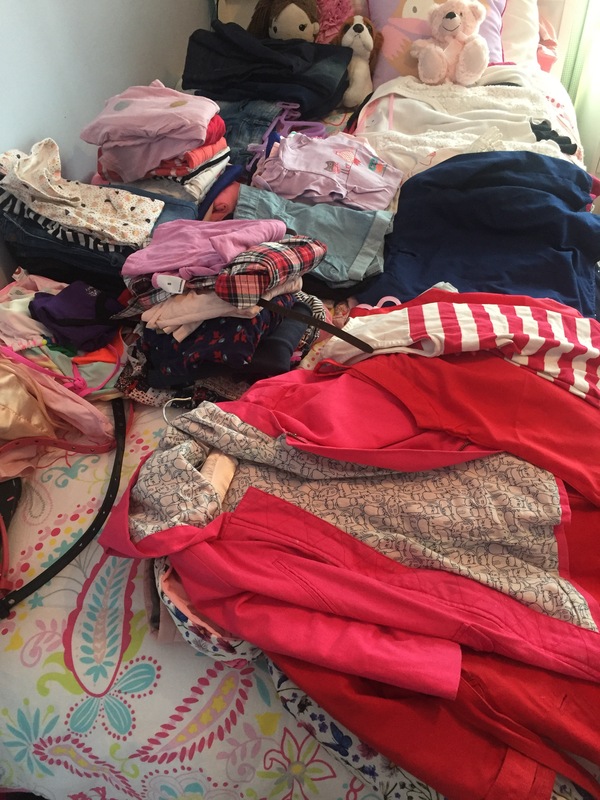 Until you see the quantity of clothing amassed together, the ridiculous amount of pens and other stationary items, you don’t really have an understanding of how much stuff you’ve got. For anyone that has read the book, you know that attending to your own belongings first is the key and commencing with your wardrobe is the first activity. 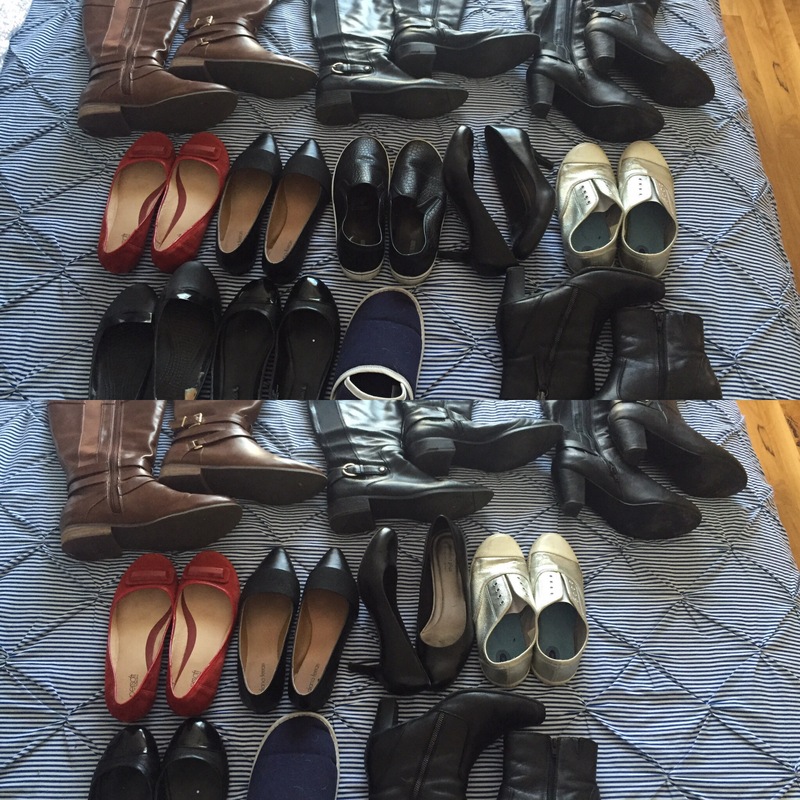 Over the next little while I will show you the results from my KonMari’ing, with my wardrobe up first.